Both my husband and I really enjoy this show. It seems like every time we start watching a new series, it never makes it to the second season and yet this show, like many others, is really great. Is it because Awake is a “clean/decent” show, one that the whole family can watch and the networks believe that this won’t sell? I agree with Joey’s comment…get rid of all the stupid reality shows. And don’t cancel this show!! It will surely get cancelled with these ratings. I hate the fact that there is nothing to do about that, because this is my favorite TV show, and definitely the best I’ve seen in ages. Unfortunately, not everyone thinks like that, and if a dramatic change doesn’t happen rating-wise, the show is walking to its grave. The recent New Yorker article will push program into renewal for next season. 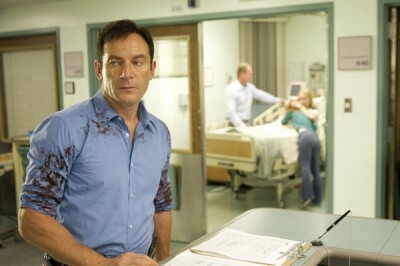 Jason Isaacs is too good for NBC to give up. If I had power, I would emergency airlift him to a better network like HBO or even AMC’s Mad Men, somehow! With ratings like that, there’s no way it gets renewed. But, I’ll miss it. There are so many formulaic, “cookie cutter” shows out there. AWAKE seems fresh. One name for science fiction is “speculative fiction”; stories that are based on asking “what If? AWAKE has an intriguing premise that fits squarely into that “what if” tradition. And the show is getting better with each episode. I love the way his two realities are bleeding into each other. Oh, the possibilities! Too bad they’re not going to happen. I definitely don’t want it gone. It is original, captivating, intense and has great acting. But then again, if it were up to me, there would never be 8 seasons of Grey’s Anatomy or 7 seasons of Supernatural. The Firm is MUCH better! That said, I do like awake, but find it way too confusing and perplexing to see it getting widespread approval. I think they should extend it indefinitely. Let them finish their entire story and the network will make money for years to come off the cult audience it will generate. If NBC cancels it, I hope someone else picks it up. I think it’s the best network TV since LOST. I look forward to it as much as I do Homeland or Breaking Bad. You should be watching Fringe. If you did and gave up, try renting the seasons and watching back to back – Fringe is everything that LOST almost was and then…wasn’t. (And I say that as someone who ardently loved LOST). Please don’t cancel Awake I have to know how it ends it’s a great show!! I think AWAKE should be renewed for a second season. It does pose an interesting dilemma for the audience. Which is the reality, or is it neither and is he the one in a coma. If he is in a coma, did his wife and son survive the accident. I think the questions should be explored more. I watch it every week, but I won’t be heartbroken if it gets cancelled. Meh. I really like Awake!! Please renew it!!! Awake is getting better and better. The people who did not watch it before will discover it later how great a show they missed. The reviews are 99% positive. It also is one of the most time-shifted shows on television, with the “live plus same day” rating for its first three telecasts growing by 59 percent when Nielsen issued “live plus seven day” ratings for that week. To heck with the antiquated Nielson ratings, NBC should know when they have an incredible show after a LONG, LONG time. I love Awake. Jason Isaacs carries the plot well. And I’m intrigued as to what is behind it all – what caused the wreck, who is pulling the strings, and which – if either – is the reality. Please do not cancel this excellently acted series.